The Cat Connection – Feline Expertise at Its Best! Welcome to the Cat Connection, your one stop shop for all things feline! As confirmed cat people ourselves, all of us at the Cat Connection are dedicated to providing you and your kitty the very best in food, services and care for life, from kittenhood through your feline's golden years. Unlike larger retailers, our small boutique setting enables our staff to get to know your cats as individuals, as well as provide you with any support you may require to keep kitty happy and healthy for years to come. Thinking of upgrading your cat's food? All food and cat supplies sold at the Cat Connection are carefully evaluated before making it to our shelves. We maintain the strictest requirements for what we sell, continuously monitoring the pet supply industry for changes in food sourcing, diminished quality, recall notifications and consumer complaints. We believe food is medicine at the Cat Connection and are invested in giving kitty the best possible dietary options for a happy and healthy life. Kitty's behavior driving you crazy? Not only do we love cats, but we know cats as well. Every staff member at the Cat Connection has life-long experience in cat care and wellness. As such, we are always happy to offer advice on your kitty's well being, no matter what the topic. Are you a first time cat owner? Having trouble adding a second cat to your home? Are kitty's litter box habits less than stellar? Just ask us! For common questions, we also maintain a helpful blog filled with cat care tips and information cat people need to know. Going away for the weekend, but don't want the cat to be left alone? We offer state-of-the-art, award-winning boarding and grooming facilities. Your cat's comfort and security is our number one priority, and all Cat Connections staff are trained to make kitty's stay with us, be it for an afternoon or a month, as relaxing and enjoyable as possible. Having trouble finding time to pick up your cat's supplies each week? 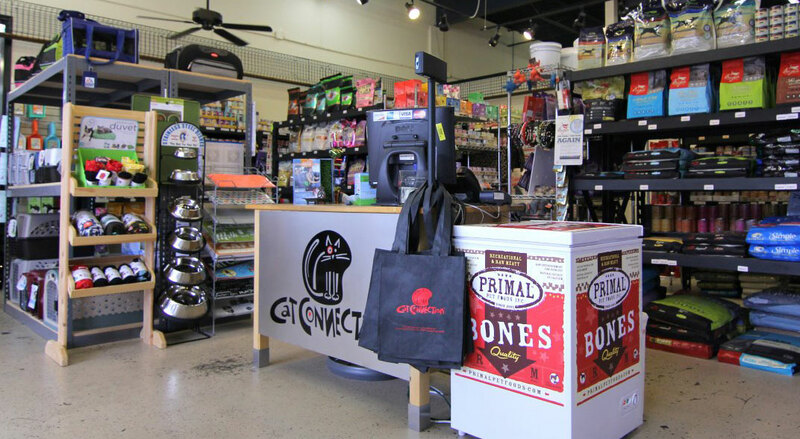 The Cat Connection offer a dynamic, easy-to-use online store, which features all of the products in our retail location. Though we'd love to see you, there is no need to travel here if you are busy. Simply shop online, and your order will be shipped to you as quickly as possible. Longing for a place to meet others who share your enthusiasm for all things cats? The Cat Connection is proud to be the meeting place for cat people of North Texas and beyond. Between book signings with notable cat authors, Dallas-Fort Worth's first pop-up Cat Cafe, and special guest appearances from internet celebricats, the Cat Connection is the place to share your love of cats with others. Searching for your new best feline friend? The Cat Connection has placed dozens of cats in new homes through our partnerships with local rescues. We feature adoptable cats in our stores, as well as at our Cat Cafes. We believe that every cat deserves a loving forever home and are dedicated to doing our part to help kitties find their special family. At the Cat Connection, your cat is as important to us as our own, and we take seriously the role we play in providing the best food, advice and support for our feline customers. We're not just a store; we're a labor of love for all things cat. Would you like to hear about the latest and greatest cat products when they arrive at our doors? Sign up for our newsletter where we share the newest arrivals. Want to participate in our feline lovin' community? Have you purchased a product from us and want to share a photo? We hope you will! Please join us and share photos on any of our social media sites: Facebook, Instagram and Twitter.